(Taken from Youth to Pro soccer emails). To develop movement patterns and combinations for a team to play through the thirds utilising a midfield 3. Utilising a progressive practice structure where the &apos;part&apos; will isolate the core patterns and techniques of the session to provide maximum repetition for players to practice and develop whilst promoting decision making and variety, before progressing into a &apos;game&apos; elemene twhich by use of practice design constraints will allow players opportunity to develop these aspects further in a game situation. There will also be a variation example of a session provided which can be utilised to combine the &apos;part&apos; and the &apos;whole&apos; within the same practice design allowing for quicker transition or to utilise more players. 1. Can you try to receive in a way that allows you to play forward early? 2. Can you try to receive in space or can you create space for a team mate to receive? 3. Can you try to provide support for the player on the ball? 4. can you try to move the ball quickly? 25x25 yard grid split into 4 zones as depicted. Blue team play vertically; Red team horizontally. 3 players from team work on inside, target players on outside. Objective is for players to transfer the ball from one side to the other playing through the 3 central players (ball can be played backwards into targets to retain possession and target players can play to each other on same end-zone). 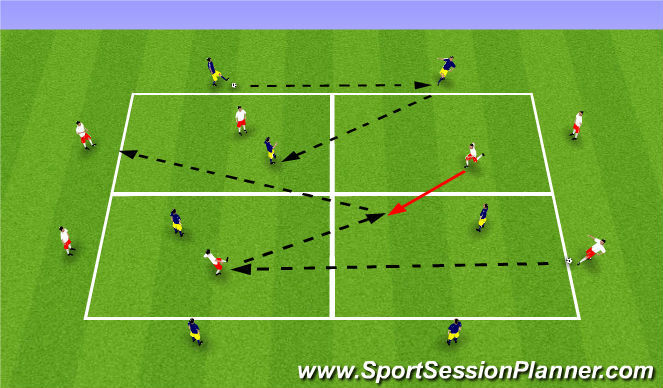 Once the ball transferred target players exchange passes before playing back in. Rotate players on inside after set period of time. Can players play off limited touches if receiving in an occupied zone (or when on outside to keep tempo). 1. Zones can be split diagonally instead of horizontally/vertically. 2. Zones can be split into 3 areas horizontally (replicate both directions by use of different colour markers). 3. Progress to opposed/ Possession based practice. Movement and positioning to create space or support. Angle of approach and triggers for movement. Passing and receiving techniques to retain possession. Pace to support; break into space. Confidence to receive in tight/pressurised areas. Fully opposed game with natural transitions. 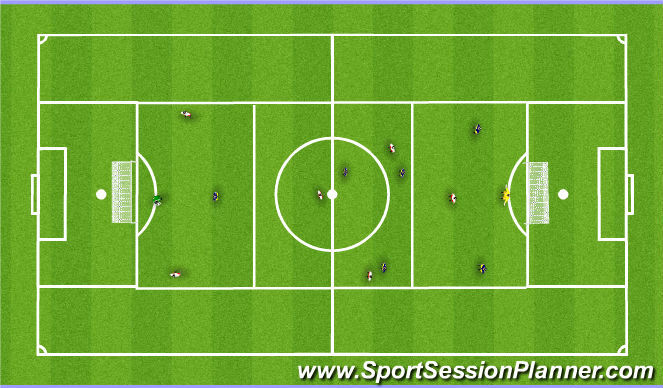 Game area: Box to box length and width of penalty area; split into middle zones as depicted. Players arranged into game specific positions include GKs (2-3-1) within zones. Objective of practice is for attacking team to try and score by playing through the midfield zone first. Once ball enters final third, 2CMs can join in to create overload. If team score restart from their GK (retain possession). Can players translate patterns and movements developed from &apos;part&apos; within the &apos;whole&apos;. Can split middle zone into 4 as with previous &apos;part&apos; to provide visual/conditional guide if necessary. CBs can drive in/ join in to create overload. Defending midfielders can recover into defensive third to reduce overload of attackers. Remove zone restrictions and play all in. Movement and postioning to create space or support. Same set up as &apos;game&apos; but with additional players in wide areas (to create 4-3-1 plus GKs). Start unopposed with both teams playing at same time to create interference. Start from GK and develop ways to play through the thirds to score. Re-set and restart from own GK after every attack. Progress to the playing &apos;game&apos; with natural transitions and restarts. Can players develop team/individual patterns and combinations before transferring them into the &apos;game&apos;. In wide areas opponent can put pressure on receiving player.